My introduction to Speyburn a couple of years ago came in the form of its 10-year-old and NAS expressions. Their light and approachable character was matched with their very affordable price tag. Flavor-wise, it’s like a sort of second cousin to Glenmorangie 10yr, without the floral notes. What’s not to love! The brand’s core range grew with the recent addition of a 15-year-old single malt. Priced at $65, Speyburn 15yr is still easy on the wallet. It matured in a combination of American oak and Spanish oak (read ex-bourbon and ex-sherry) casks. The nose hints at a creamy whisky, with vanilla, orange peel, and dried fruit. It reminds me of a custard dessert like a crème caramel. On the palate, creamy toffee and vanilla kick things off. Developing soon after are spice notes, dried fruits and semi-sweet chocolate. Bitter orange appears on the back palate. The long finish is warm, with hints of creamy vanilla and orange peel. Compared to its younger 10-year-old sibling, Speyburn 15-year-old manages to bring a slightly darker and elegant quality to the table – the toffee’s a bit darker, more spice, and the addition of dark chocolate. The dried fruit add even more complexity. Thanks to Speyburn for the sample. As always, all thoughts and opinions are my own. Every now and then I like to sit and taste through a distillery’s whisky porfolio, and that’s just what I’m doing here with Speyburn. Built in 1897, founder John Hopkins wanted to fill his first barrel with whisky in order to celebrate the Queen Victoria’s Diamond Jubilee. Working through some nasty winter conditions, Hopkins and team were able to fill their first barrel in December of that year, just making his self imposed deadline. The distillery itself is located in the Speyside region. 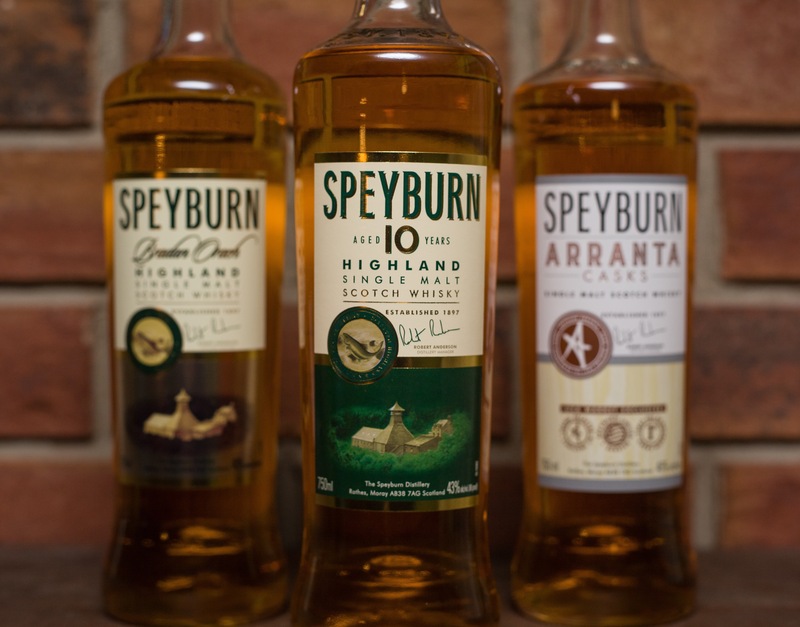 Speyburn isn’t that well known here in the United States, and those that do know it generally regard it as a great value pour. The whisky coming from Speyburn is a light Highland style, so don’t look for huge peat or sherry notes here. Their standard whisky portfolio consists of a 10-year-old whisky and two NAS whiskies, Bradan Orach and Arranta Casks. I’ve seen the 10-year-old on the shelves of stores that have a decent whisky selection, so it’s readily available. It is a blend of American Oak ex-bourbon and ex-sherry casks. Bradan Orach, Gaelic for “Golden Salmon”, is Speyburn’s entry level malt. It is matured in ex-bourbon casks. The U.S. exclusive Arranta Casks matures in first fill ex-bourbon casks. Thanks to Speyburn for the generous samples! As always, all thoughts and opinions are my own.